It is now possible to design and manufacture true three dimensional shapes in schools. Modern machines such as Boxford’s A3 HSRi² Router can be used to manufacture products designed in software such as Pro/DESKTOP®, with a combination of accuracy and speed. The router can shape a variety of materials including perspex, MDF and model board. 3D modelling brings modern design and manufacturing technology into the school / college workshop. 1. 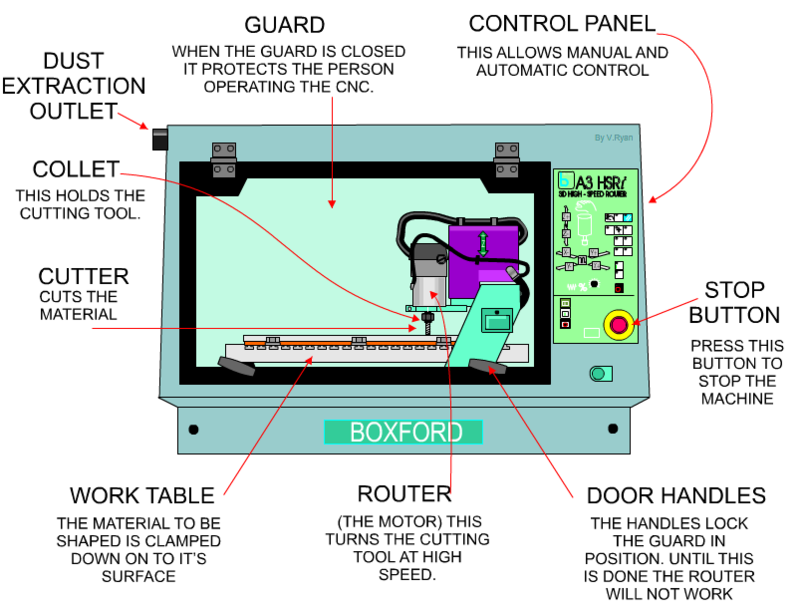 Draw a simplified diagram of the CNC machine shown above. Label all the parts. 2. List five of the parts label on the CNC above and explain what they are for or what they do. 3. Give an example of a 3D object that could be designed and manufactured school by pupils.